Snacking is a great way to boost energy levels and prevent overeating at meals. Non-perishable foods do not require refrigeration, making them a convenient option for snacking. While some non-perishable foods contain excess fat, sugar or sodium, many healthy options are available. Learning how to choose healthy non-perishable snacks allows you to enjoy the foods you love without wrecking your diet. Canned fruits and vegetables are an excellent source of nutrients. The University of Illinois Department of Food Science and Human Nutrition states that the nutrient content of most canned fruits and vegetables is similar to that of fresh produce. Canned spinach, carrots, sweet potatoes and apricots are high in vitamin A, while canned oranges, pineapples and tomatoes are good sources of vitamin C. When shopping for canned foods, avoid those with added sugar or sodium. Fruits packed in their own juices instead of sugary syrups are a better option for healthy snacking. Oatmeal is a classic breakfast food that also makes a scrumptious snack. It is low in saturated fat, sodium and cholesterol and is a good source of several nutrients, including selenium, manganese and phosphorus. 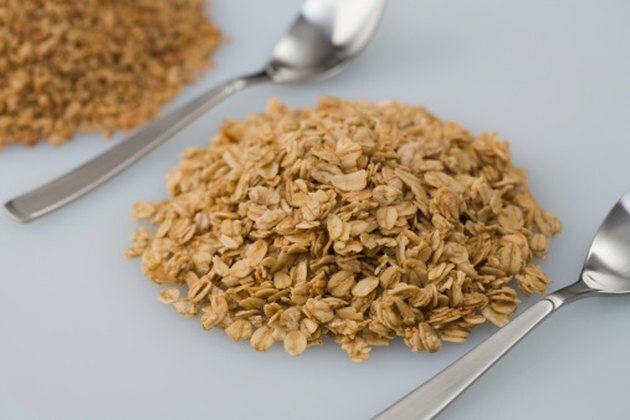 Oatmeal also provides dietary fiber, which is often lacking in the typical Western diet. This versatile snack can be served hot or cold and tastes great topped with blueberries, banana slices or a touch of cinnamon. Before purchasing oatmeal, check the label for added sugar. Often enjoyed as a dinner entree, pasta makes a delicious and filling snack when served in small portions. Pasta made from whole grains like quinoa or amaranth is especially nutritious. According to the USDA Nutrient Data Laboratory, a cup of quinoa pasta contains over 14 percent of the daily value of protein, between 15 and 30 percent iron, and more than 50 percent manganese. When serving pasta as a snack, limit portions to 100 calories and avoid adding high fat sauces or dressings. Instead, sprinkle on herbs like thyme, rosemary or oregano and add a spritz of lemon juice for flavor. Pretzels are a tasty non-perishable snack that is sure to please. Complex carbohydrates like whole grains provide the body with lasting energy and are a good source of nutrients and fiber. For a convenient and healthy snack idea, Kids Health suggests whole wheat pretzels with spicy mustard. Other whole grain products like crackers and cereal are also non-perishable, nutritious and great for snacking.